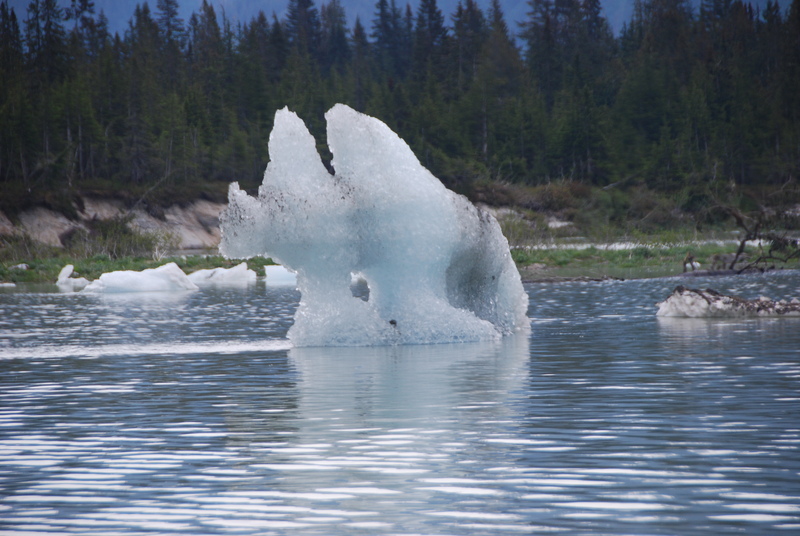 North to Alaska… and our Last Frontier! 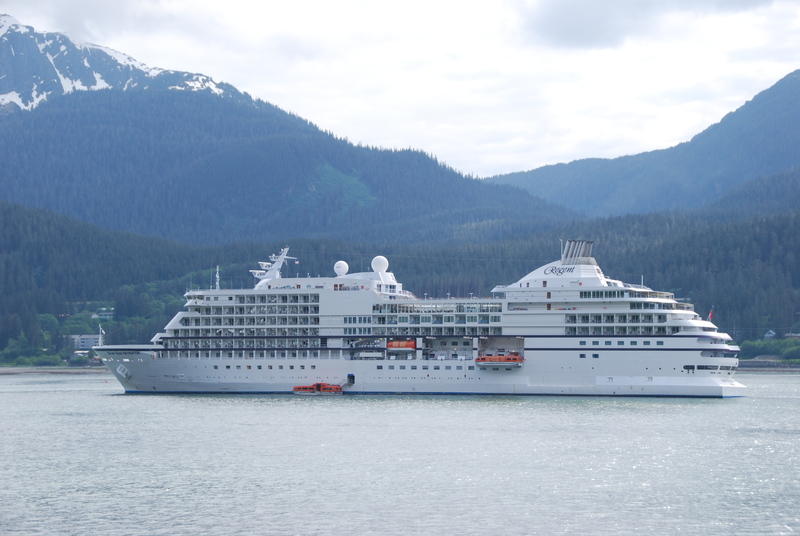 NORTH to Alaska… The Last Frontier… aboard the casually- elegant – but very classy… 490-guest Regent Seven Seas Navigator. We planned this itinerary during the spring “shoulder” season (of mid/late May)to Alaska – to take advantage of fewer visitors in port; fewer ships in port and for a better opportunity to enjoy this magnificent destination without being so crowded everywhere we went. AND…It was PERFECT! Ed Hill, my significant other, had never been to Alaska, and as this was my 4th cruise ( three of which were with Regent Seven Seas), we opted for the north-bound itinerary of Vancouver to Anchorage (Seward.) We enjoyed a delightful overnight stay in Vancouver at The Four Seasons (which was inclusive with our cruise fare). 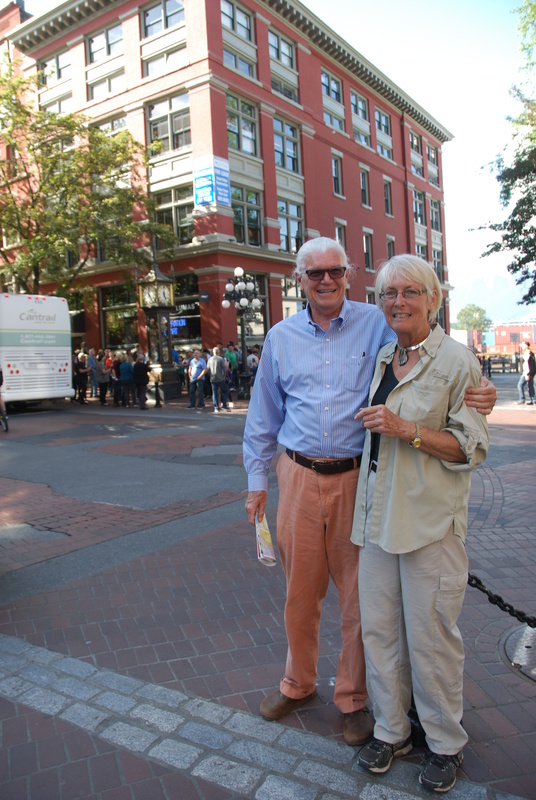 Our visit again to this beautiful city included a fun afternoon strolling the cobble stoned streets of historic Gastown, enjoying a delightful two-hour lunch and people-watching, and seeing the famous steam clock “blow” on the hour at 5pm. Tourism in Vancouver is very good. Every shopkeeper with whom we spoke – said business had been “terrific.” And the weather could not have been more beautiful – mid 60s, light breeze and sunny. The next morning, we walked to the pier (about 10 minutes from the hotel) to get our bearings. Came back and got our carry-on bags and swiftly and efficiently proceeded through RSSC’s embarkation and were on the Navigator in about 30 minutes. Another absolutely gorgeous day in Canada and we are so excited to be on board. First, we met with our butler, Zahid ( a native of India) and enjoyed a “welcome” glass of champagne before embarking on a quick tour of the ship. We both agreed: What a grand itinerary we had ahead! Time tor relax and enjoy room service dinner our first night on board and to watch a movie. The gym on top deck ( Deck 12) is small but well furnished. A variety of classes – stretch, tone, spin, yoga – are offered in one room, cardio equipment, free weights and machines in the other. The Canyon Ranch Spa is adjacent to the gym/fitness area. The spa services were absolutely superb. We enjoyed deep tissue massages and I also enjoyed a manicure/pedicure. The staff is excellent, attentive, and very professional. Truly one of the best massages and pedicures I’ve ever enjoyed. We are on Deck 10 – the best deck as far as we were concerned: The Pool Grill, The Veranda/Sette Mari and also Prime 7 (specialty dining venue) – all located on Deck 10. We have a lovely balcony and the scenery is spectacular! Ketchikan…. Our first port of call. 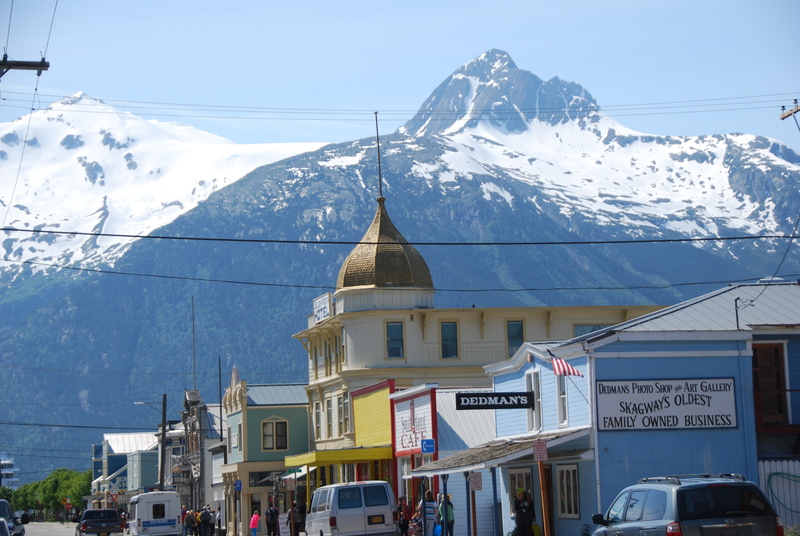 Although several miles long, the town is only 10 blocks wide and centers on its main drag – Tongass Avenue. 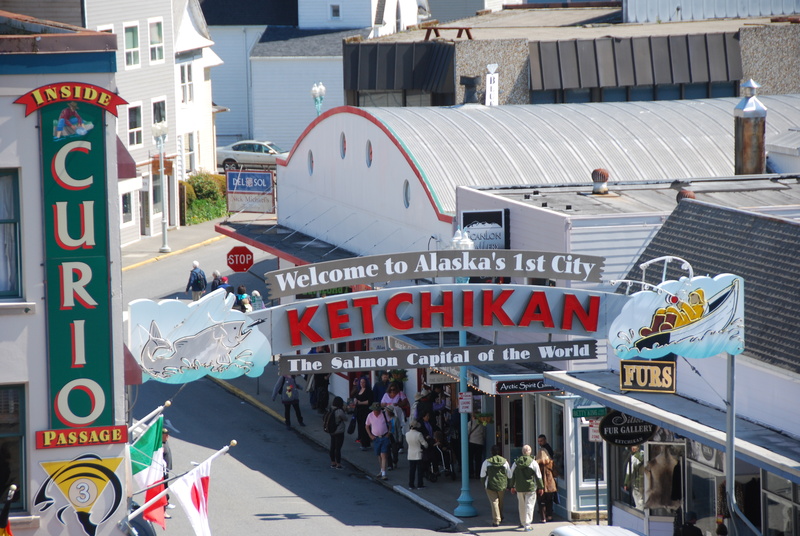 Founded as a cannery site in 1885, Ketchikan’s mainstay for most of its existence was salmon, then timber when a huge Pulp Mill was built in in the mid 1950s. The name Ketchikan is a native term “Katch Kanna” – which loosely translated means “spread wings of a thundering eagle.” Even though commercial fishing industry generates almost 1/3 of the income for the local economy – it is definitely tourism that’s bringing in the money. In speaking with several local merchants – IF the business is family-owned, it stays open year around. For example at this huge, multi-level retail store –just steps from our ship – where you could purchase everything from quality clothing and souvenirs to grocery items and over-the-counter medicines, the “season” is roughly early May to late September. Then the store converts to Christmas decorations, etc through the holidays before starting up again in Spring stocking merchandise for the next round of visitors. (And there are days during high season where 6 ships could be in port at the same time.) After all the shopping, we needed a refreshment – and wandered through town till we found a local bar. Our bartender told us that her bar also stayed open year round as it was “family-owned.” Once back on board…Another relaxing evening ahead: Room service served from the main dining room – Compass Rose – and more movies to watch as we sail to our next port. 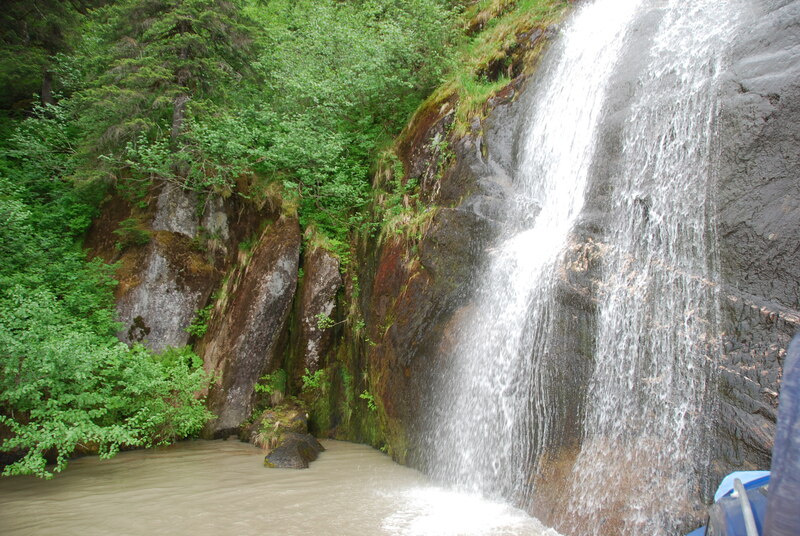 One of many magnificent waterfalls – up close and personal – from our jet boat on the Stikine River and Glacier Lake. Our excursion was the “Stikine River & Glacier Lake by Jet Boat.” For almost 4 hours ( from 8am till about noon), we sped along the river and the lake and viewed many soaring eagles, a beaver’s dam and took photos of waterfalls, sky-blue giant chunks ice that had broken free of the glaciers and viewed gorgeous snow-covered mountains – all as a back drop to the stunning scenes on the water. There were three jet boats on this early morning excursion (we boarded at the pier where our ship was docked), with a total of six of us in Becky’s boat. (Becky was not only an Alaskan native, but an accomplished fifth -generation boat captain, and she was also a very well known local artist. The reason we knew there were a total of 3 boats in our group is that Ed and I ended up on all three. Becky had engine trouble about half-way through our excursion and we were “rescued” by another boat. Then after about 15 minutes on that boat, we were transferred to a third boat to conclude our excursion. The tour concluded with all of us enjoying a delightful wine and cheese and smoked salmon tasting before we returned to the dock. This tour: Highly recommended! And dinner this evening…. Prime 7. We shared a table with two other couples who were both celebrating anniversaries – 5th and 15th. It seemed we all had a story to tell – especially since it was the first marriage for the 5th anniversary couple, second marriage each for the couple celebrating their 15th anniversary, and for Ed and me – since we had both lost our spouses several years ago – we shared funny stories about how we met (7 mutual friends had set up our “blind date”) and how at “our age” in our late 60s – we had both become very set in our ways. All in all…great conversation, lots of laughter and lots of toasts all around. But first… a bit of background about Juneau. Known as a “capital of contrasts and conflicts”, Juneau borders a waterway that never freezes but lies beneath an ice field that never melts. It is the state capital – “but since the 1980s, Alaskans have been trying to move it. Juneau doesn’t have any roads that go anywhere, yet half of its residents and its mayor opposed a plan to build one that would.” As the state’s first major gold strike and the first town to be founded after Alaska’s purchase from the Russians, Juneau became the territorial capital in 1906. 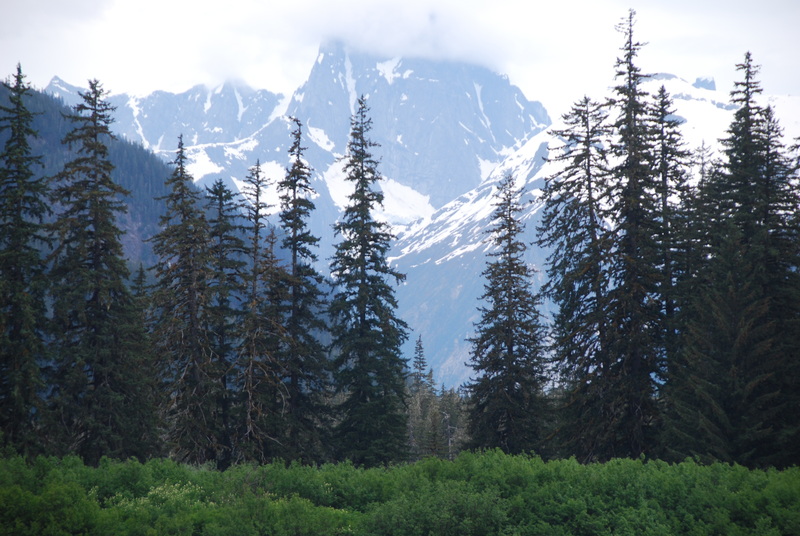 Known for its superb hiking, Juneau also is the departure point for numerous wilderness attractions – including paddling “paradises” at Glacier Bay National Park, Tracy Arm Wilderness Area and Admiralty Island National Park. The waterfront bustles with cruise ships, fishing boats and float planes. Without a doubt, Juneau is “the most beautiful city in Alaska and arguably the nation’s most scenic capital. The downtown area clings to a mountainside, while the rest of the city “officially” sprawls some 3,100 square miles to the Canadian border – making it one of the largest cities (area-wise) in the U.S.
Now for our incredible trip to the Taku Glacier Lodge – via float plane. There were 4 float planes from the ship going to this lodge. Our plane held 10 passengers. I took so many photos from the plane (each of us had a window seat) -e.g. vistas of snow-capped mountains, glaciers, deep blue ice piercing the waters below – and all spectacularly-beautiful. 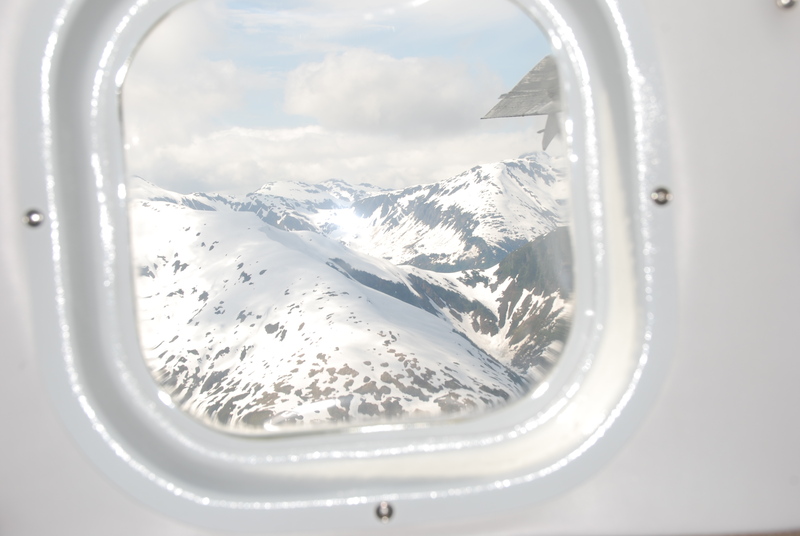 Juneau Ice Field from our float plane window. 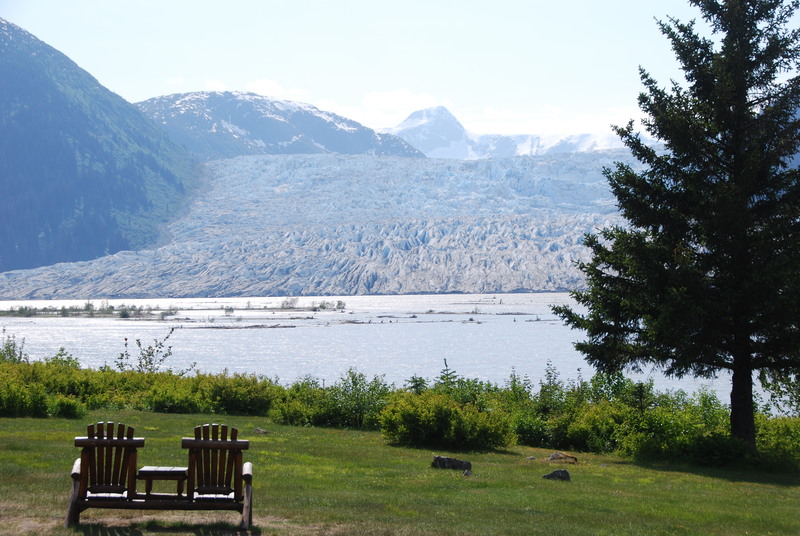 The view of the ascending Taku Glacier from the front lawn of the 1923 Taku Glacier Lodge. We flew over the Juneau Icefield that stretches more than 1,500 square miles and is home to over 40 large glaciers and 100 small ones. Of all the glaciers we saw during our flight, the Taku Glacier is the most unique as it is recognized as “the deepest and thickest glacier known in the world!” It is also the largest glacier in the Icefield and it is the ONLY advancing glacier! After about 20 minutes of incredible sights, we landed at Taku Lodge. Constructed in 1923, the Taku Glacier Lodge was built by a Juneau physician who used the lodge for hunting and fishing. Even to this day, supplies are transported from Juneau by river boat or barge and trips have to be timed for passage over the numerous sand bars at high tide. Ownership changed over the years and it wasn’t until 1979 when the current owners decided to share their love of the Taku Glacier Lodge with visitors of Southeast Alaska by offering Wilderness Salmon Bake and Scenic Flights – very similar to what Ed and I enjoyed this beautiful Sunday afternoon of Memorial Day weekend. One of the Lodge’s resident bears “Gabi” came to “dine” on scraps from the grill -left-over from our delicious salmon luncheon. What an incredible adventure and what an incredible destination. The highlight of the afternoon – we thought – would be the freshly-grilled salmon and a delicious variety of sides, served with beer and wine. It was truly the finest grilled salmon we had ever enjoyed. But this fine meal turned out to be the second best part of our adventure on this island. #1 – the bears! 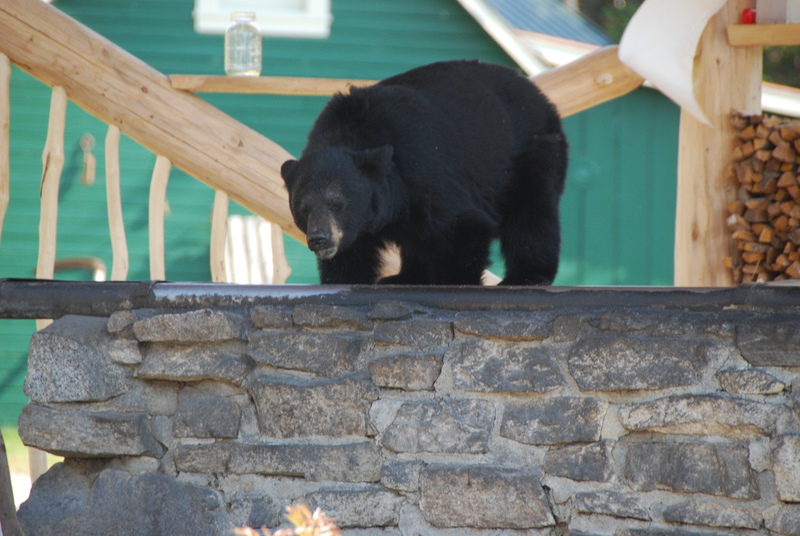 According to our hosts, there are six resident black bear who “reside ” in the area. And just as we were finishing lunch, a young black bear (about 6 years old, weighing around 200 lbs, and named “Gabby”) jumped up on the giant grill area and began licking up all the scraps, and marinate/sauce that was used to flavor the salmon. She was quite the “show”. as we stood maybe 20 feet from her while taking photos. 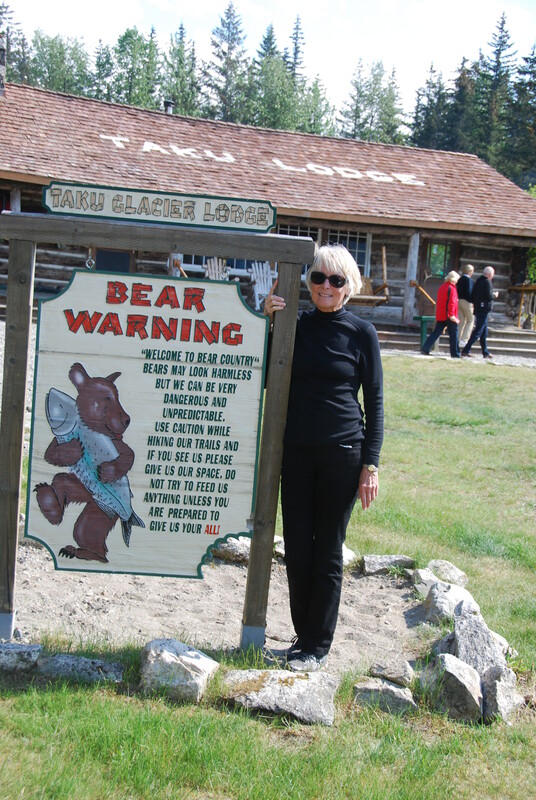 Taku Glacier Lodge and the warning about the bears! Skagway – our last port of call on this marvelous itinerary. Monday, the 25th was Memorial Day and we docked in Skagway. We didn’t have an excursion planned, so we just opted to enjoy lunch in town and “people-watch.” It was fun. Skagway is located at the head of Lynn Canal – and is one of the driest places in an otherwise soggy Southeast part of the state. As a comparison, Ketchikan averages 154 inches of rainfall annually; Skagway – 26 inches. Much of Skagway is within the Klondike Gold Rush National Historical Park – which encompasses downtown Skagway, the Chilkoot Trail, the White Pass Trail corridor and a visitors center. In 1897, Skagway was one of two starting places for the more than 40,000 gold-rush enthusiasts who headed to the Yukon via Chilkoot Trail. Tuesday was our last day and it was also a sea day. Time to get everything together to debark early Wednesday morning. As I look back on the week – activities that we personally enjoyed the most were the excellent spa services, excellent room service, playing bingo and for me- working out in the gym. The only “show” we attended was the last evening with the “Krew Kapers.” Both our stewardess and butler were in the show and it was FUN!!! We had dinner our last evening in The Compass Rose and it was superb. Wednesday morning, we debarked the ship around 8am for the 2 1/2 hour motorcoach ride to Anchorage. It’s only 120 miles – but we took a rest stop enroute and in many areas the maximum speed limit was 45 mph. The ship had arranged for about 50 of us to spend the afternoon in a Hospitality Room on the top floor of the Anchorage Hilton. The hotel provided coffee and tea and cookies and plenty of places to plug in a phone or ipad while we waited to take the short bus ride to the airport. IF there was a downside to this trip – it was having to fly home from Anchorage. Even with an air deviation on Delta Airlines to be more accommodating to our schedule, we still had to fly seven hours all night from Anchorage to Atlanta, then a quick transfer to our Houston Hobby flight Thursday morning. The good thing: We were back in our homes in Galveston before 10am. First the level of service… Regardless of where you go onboard – you will be greeted with a smile filled with warmth. And I am not exaggerating! We were so impressed with the quality of service and friendly staff. From our butler, Zahid, to our housekeeper, Rose Marie – everyone quickly learns your name and your routine. Next cruise: Either fly into Anchorage and get that LONG flight out of the way and sail southbound to Vancouver and then fly home from Vancouver to Houston /Galveston OR, even better: Select a roundtrip Vancouver itinerary. Also, Alaska is on its own time zone: AKDT (Alaska Daylight Time.) So from Houston/Galveston – it’s a 3-hour difference. Dress code on this Alaska sailing was defined as ” Elegant Casual” which meant nice dress; slacks/sweater/jacket for ladies; sports shirt/slacks; jacket optional for gentlemen. In Prime 7 – most gentlemen wore a jacket and many wore a tie. Throughout the ship, you always felt comfortable, relaxed. It was a great feeling! Every amenity, service – whatever you wanted/needed – it was there for the asking. I understand that the Navigator will be deployed to The Caribbean starting next year, and that the stunning and spacious 700-guest Seven Seas Mariner will sail the spectacular Alaskan coastlines. And last, but certainly not least… the quality of service, professionalism, knowledge and attention to detail that Fox Travel’s cruise expert, Debbie Parker, provided us was exceptional. How fortunate to have had Debbie handle all our arrangements. I’m so ready to return again to This Great Land… it’s ever changing, yet always beautiful and so peaceful. Very nice and vicariously enjoyable. I am having to rethink my concept of cruises.